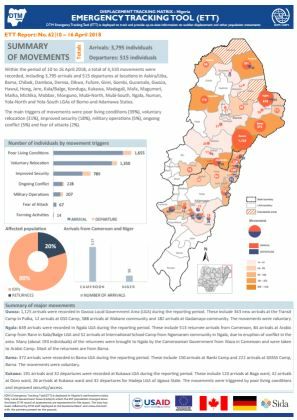 With the onset of the rainy season in Borno State, strong winds and sandstorms have wreaked varying degrees of damage to infrastructures at displacement sites, including camps and camp-like settings. 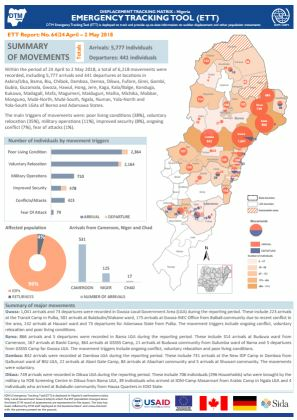 IOM Nigeria DTM is pleased to share latest updates on Biometric Registration of the affected population in Pulka/Bokko ward of Gwoza Local Government Area (LGA), Borno State. 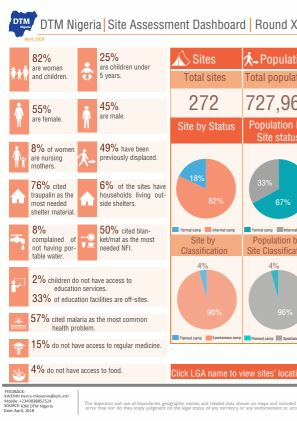 The following document provides information on the sites assessed in Yobe as of April 2018. 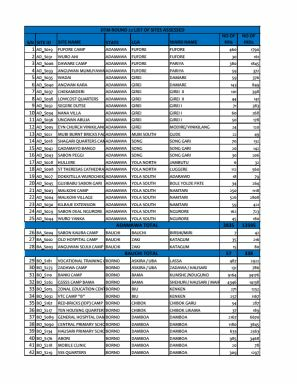 The following document provides information on the sites assessed in Adamawa as of April 2018. 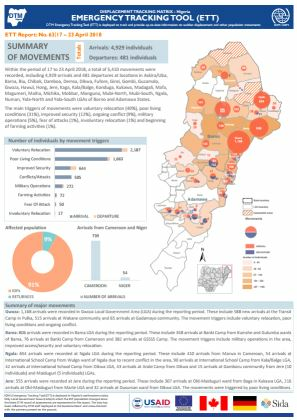 The following document provides information on the sites assessed in Taraba as of April 2018. 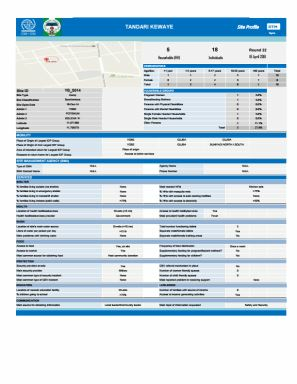 The following document provides information on the sites assessed in Bauchi as of April 2018. 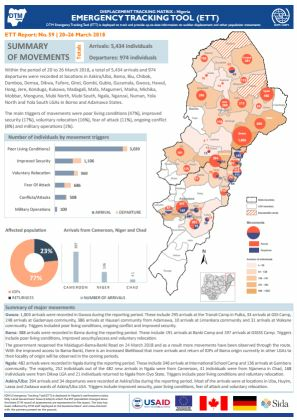 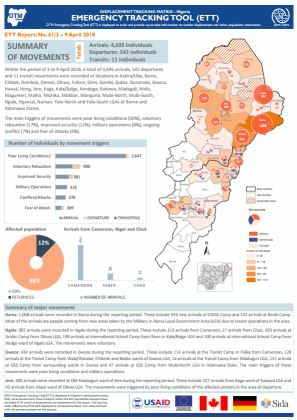 As of 18 April 2018, the DTM has identified 1,881,198 IDPs (357,016 households) across Adamawa, Bauchi, Borno, Gombe, Taraba, and Yobe States. 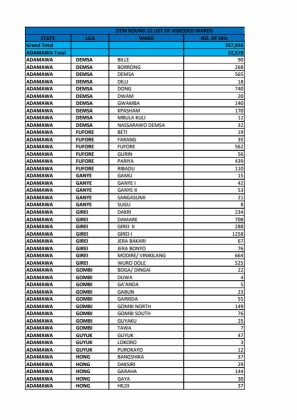 This represents an increase of 6 per cent (98,708 individuals) from the previous DTM Round. 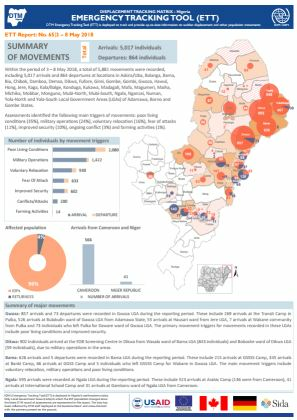 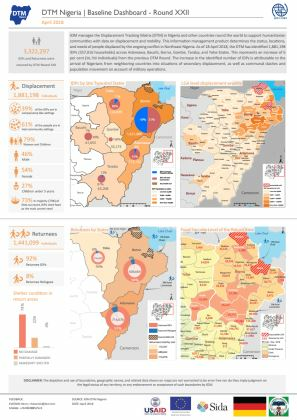 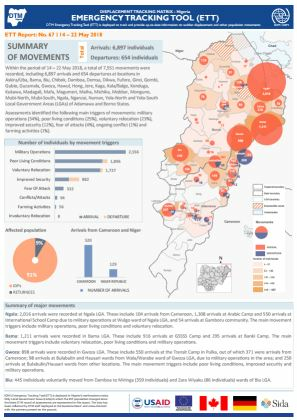 This dashboard presents the variation in the number of IDPs between Rounds XXI and XXII in all assessed Local Government Areas (LGAs) in Northeast Nigeria. 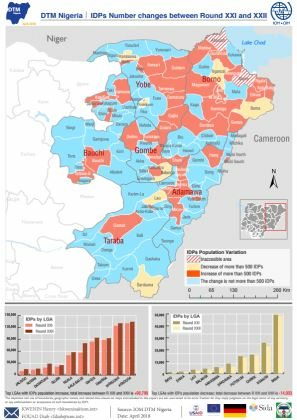 The site assessments conducted during Nigeria's DTM Round XXII found that 82% of the assessed population are women and children (55% are female and 25% are children under 5 years of age). 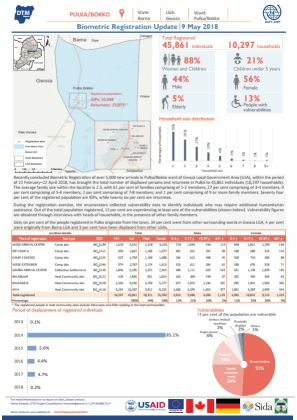 Almost half of the affected population (49%) have been previously displaced. 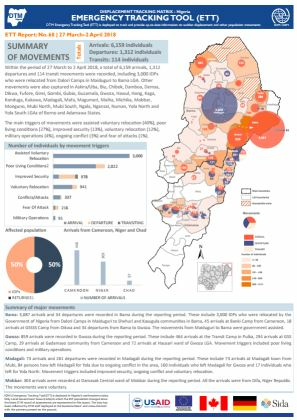 1,881,198 IDPs were identified during Round XXII in Nigeria. This document provides the list of wards assessed and the numbers of individuals and households identified in each, organised by State and Local Government Area (LGA). 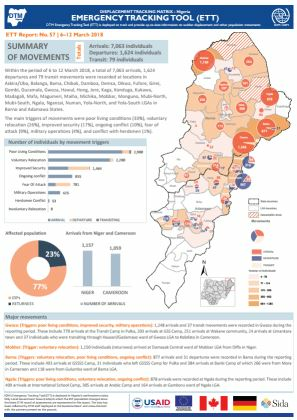 1,881,198 IDPs were identified during Round XXII in Nigeria. 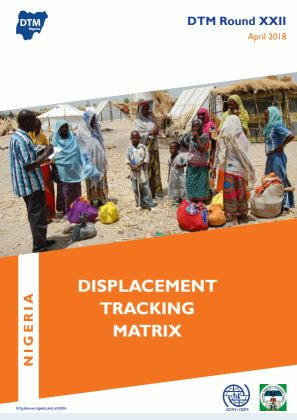 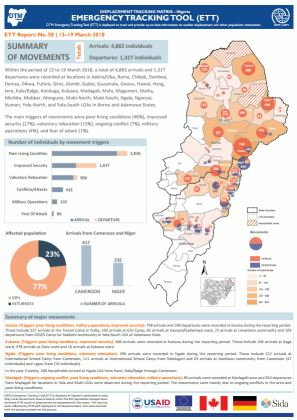 This report of the Round XXII Displacement Tracking Matrix (DTM) assessment by the International Organization for Migration (IOM) aims to improve understanding of the scope of internal displacements, returns and the needs of aﬀected populations in conﬂict-aﬀected states of north-eastern Nigeria. 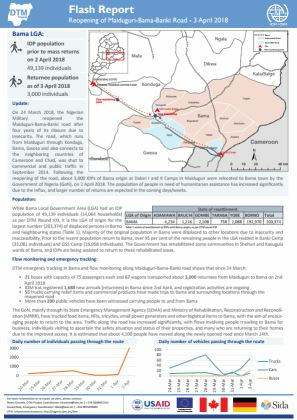 Within the period of 27 March to 2 April 2018, a total of 6,159 arrivals, 1,312 departures and 114 transit movements were recorded, including 3,000 IDPs who were relocated from Dalori Camps in Maiduguri to Bama LGA. 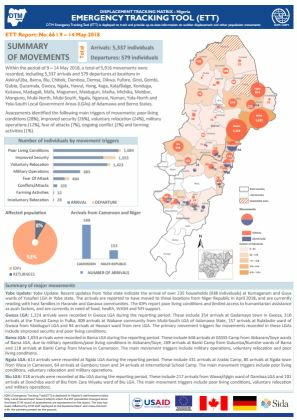 On 24 March 2018, the Nigerian Military reopened the Maiduguri-Bama-Banki road after four years of its closure due to insecurity. 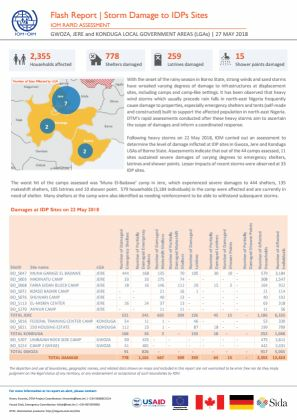 The DTM Emergency Tracking Tool (ETT) is deployed to track and provide up-to-date information on sudden displacement and other population movements.